earlier.) In the mean time, we wanted to give you a brief update on this feature. Of course, we're still working on this feature, so we'll likely make additional changes before releasing it. We hope you like these new features--please let us know what you think in the discussion group! a sneak peak at our upcoming billing feature, which will enable your app to grow beyond our free quotas! In addition to the Downtime Notify Google Group, we'll use this dashboard to announce scheduled downtime and explain any issues that affect App Engine applications. You'll be able to see real data behind any issues that we experience along with explanations from our team. We'll continue to tune this dashboard to make sure we're providing useful and accurate information about App Engine's uptime. We expect this tool will complement others offered by other companies, such as Hyperic's CloudStatus. 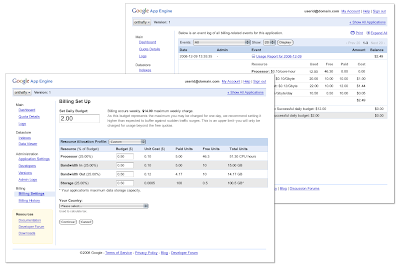 For each App Engine application, we now provide a Quota Details Dashboard. This makes it easier to track how much of the free quota your app is using up across bandwidth, CPU, etc. Use it to get detailed information about all of the resource quotas that affect your application. To use the Quota Details Dashboard, click the "Quota Details" link on the dashboard for any app. As mentioned in the product roadmap, soon you'll be able to buy additional capacity beyond the free quotas. (For reference, we described our expected pricing earlier.) In the mean time, we wanted to give you a brief update on this feature.